Sadness struck the rugby world this week as news of Jonah Lomu’s death filtered through. The 40-year-old, who had been suffering from a rare kidney condition, was one of the most famous men in the sport, a role model for so many. 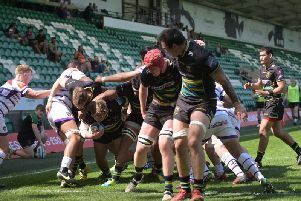 At Franklin’s Gardens on Wednesday, members of the Saints squad, along with director of rugby Jim Mallinder, paid tribute to a man who scored 37 tries in 63 matches for New Zealand between 1994 and 2002. Samoan centre George Pisi, who played alongside Lomu for New Zealand outfit North Harbour in 2006, said: “I was in my first season, just coming out of school, and I looked up to Jonah, everybody did. “He was just the most humble guy and he really took the young guys under his wing. “He taught me a few lessons, that no matter how experienced you are and whatever you’ve done in the game, you’re never too big to talk to anyone. “I was just privileged enough to get the chance to train with him and play with him. “Maybe he wasn’t at his peak then and he was coming back from his sickness, but he was still the same humble, down-to-earth guy that everyone respected. “He was someone you always wanted to pass the ball to. He was a hard worker, hard trainer, but very generous. “He had contact with everyone and he looked after you, treating everyone as if he had known them for years. “He could turn the rugby mode on and off and at that time of his career he was just coming back in. “His work ethic was eye-opening for everyone. He came back from kidney disease and worked harder than everyone else. “It’s sad news for New Zealand rugby, losing legends like Jerry Collins and Jonah Lomu, and everyone’s grieving back home. “I’ve got a photo on my Facebook of Jonah with his arm around me, talking to me and that was me just coming out of school. You look up to these guys. “He was just an athlete, back at school he was bigger than everyone else. Mallinder, a former full-back, played against Lomu during the Saints director of rugby’s England days. And Mallinder reflected: “He was an outstanding player and fantastic for the game of rugby. “He was a real role model for boys and girls to look up to. “I played against him so I remember what a fantastic player he was. “He was one of the first big backs: big, athletic and skilful and we see a lot of those players nowaways, but he was one of the first. “I played against him. I don’t know if it was for North of England or England A. “I’ve still got a picture at home and it looks like a skinny, pathetic full-back attempting to tackle a big muscular, left winger. The picture is still on my wall. “It was a fantastic experience – you’ve got to commit yourself and I think as South Africa found in that final (1995 World Cup) you need a bit of help from your friends to tackle him. Teimana Harrison hails from New Zealand and grew up idolising Lomu. The Saints flanker said: “Funnily enough, my old principal, Chris Grinter, used to coach him. Chris was always showing us videos of him; his highlights and stuff. “He was a global hero to everyone, everybody knew who he was and everyone would watch his clips on YouTube, aspiring to be like him. “I don’t know the full story, but it sounded like he came from nothing – didn’t come from money or have any special privileges. “He worked hard at what he wanted and became the best in the world.